There have been workout videos ever since there has been the ability to make videos. Now the Internet and things like YouTube have made more of them – and you don’t even have to buy them. I found this one on my SparkPeople email this morning. It’s Quiet Cardio! I like SparkPeople. They have something for everyone. I remember back in the ’70’s when VHS and Beta Video Tape Players were introduced to the general population and all of a sudden, you could rent videos. You could buy them, too, but when it all started they were about $100 ea. Now you can buy DVDs in the Dollar store for $2.00 and 3 for $10 at Walmart. But why buy them now when it’s on the internet? Jane Fonda showed the world her version of Pilates before the rest of us even knew what it was. Richard Simmons made a fortune with series of videos for truly obese people. The music was fun and he was so funny to watch and follow. Yes, I lost it “Sweatin’ With the Oldies”. Even Cher had a couple of workout videos and they’re having a renaissance. Now there are whole sets of videos from Bootcamp to Beachbody. You can have the trainers from Biggest Loser or Burlesque. I found a website that is the Amazon.com of workout videos. It has 938 top-ranked videos, collagevdeo.com. This has opened a whole new can of worms. Very healthy, well-built worms, but still worms. I live on a cul-de-sac and my neighbours across the street has a huge TV that I can watch from my kitchen window. Imagine if they were working out in the comfort of their home to Jillian putting them through their paces? I’m having way too many scary images in my head. That’s what I would look like, too. I know people have been working out with their TVs ever since there have been TV’s. 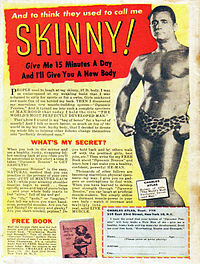 There was Charles Atlas (of the comic book back cover fame), Jack Lalanne and 5BX (RCAF). George Burns used the 5BX and lived to be over 100. My Dad used 5BX, too but he was in the Navy (RCN). So many of us workout at home now. And if videos help, why not! You can take them on your phone, computer etc. I thought I didn’t own any but it turns out there are a couple from the girls downstairs. They aren’t tapes but DVD’s and include Billy Blanks and Tae Bo and some yoga ones. Sigh. I never used those. I know I can borrow them from the library or get them really cheap at thrift stores. But, right now, I’ll stick to my hand-outs from the joint replacement clinic and the Arthritis Centre and go at my own speed. Then, when the urge strikes me, I’ll do some chair exercises I got off YouTube. ~ by 1fatgirlshrinking - Diane Kirby on October 23, 2012. The following hhlatey living recommendations will help you if you’re trying to lose weight, tone up your muscles, have aspirations of building lean muscle mass, are attempting to get a wash board stomach, or just want to feel better:*1) Burn more calories then you’re consuming everyday and measure your results using the following formula: Calories Consumed minus Basal Metabolic Rate (BMR) minus Physical Activity. Get a fitness calculator that you can put on your cell phone and computer. This will allow you to easily calculate this formula, log your daily calorie consumption, and register your physical activities. *2) Eat natural and organic foods found on earth versus something created by a corporation to make money. Eat meals in small portions throughout the day and take a good multi-vitamin supplement. Avoid “High Glycemic Load Carbs” (sugar, pastries, desserts, refined starches such as breads, pasta, refined grains like white rice; high starch vegetables such as white potatoes) and drink lots of water. Do not try fad diets or diet pills. Here is an excellent food pyramid that anyone can follow:*3) Exercise on most days by doing cardiovascular training and/or resistance training activities. Read a book or find a certified trainer to make sure your doing all resistance training exercises correctly. A great book to buy that teaches you the resistance training basics is “Weight Training for Dummies”. A superb magazine to buy with excellent resistance training routines that will not get you bored is Muscle and Fitness . Signup for the free newsletter.A good book to buy that teaches you the cardiovascular training basics is “Fitness for Dummies”. *4) Get plenty of sleep. Sleep experts say most adults need between seven and nine hours of sleep each night for optimum performance, health, and safety. *5) Educate yourself continually on health issues and make a life long commitment to good health. A great free publication is “Dietary Guidelines for Americans 2005”. A superb book to read is “You The Owner’s Manual”. An excellent periodic publication is the “Nutrition Action Health Letter”. A reputable test you can take to measure your biological age is atLook at all areas where you can enhance your health. For example, make improvements in the quality of the air you breathe. Review outdoor air quality forecasts where you live and get an indoor air purifier. Email me if you want a good indoor air purifier recommendation and if you have other questions. *Click on all the source links below to get the full benefit of the recommendations. The answers presented to your health questions are not intended to be a substitute for professional medical advice, diagnosis, or treatment. Always seek the advice of your physician or other qualified health providers with any questions you may have regarding a medical condition. I couldn’t find it anywhere on Google. Sounds interesting!